From mobile phones to tablets to computers, the way we do business is constantly adapting and evolving. Video is a powerful way to create a loyal following online, and share your brand in a way that customers will remember. Not only in a consumer facing manner, 87% of respondents in a survey believe they would rely on virtual, video meetings for one out of every four workplace interactions. 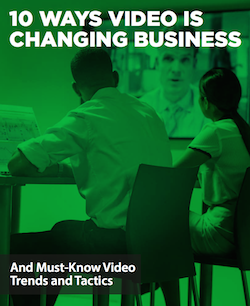 To learn more about how video conferencing can drive real impact at your business download and read our latest guide 10 Ways Video is Changing Business.